...without measuring and weighing everything you eat! You struggle with food cravings. You want to add more variety to your diet, but don’t know what food to purchase to make healthy quick meals. You want to start eating healthier to improve your health, maybe using meal planning, but unsure of how to do so because it seems like meal planners spend a lot of time cooking in the kitchen. Learn how to organize your kitchen in a way that will prevent food cravings and encourage you to eat more nutritious foods. Learn how to stock up your kitchen with ingredients that will make healthy meals and snacks simple to prepare. Learn how to use meal prep to eat better without spending a whole day cooking food in advance. See real life examples of what Susan does every day in the kitchen to stay on track! Hi I'm Susan Watson, dietitian, busy mom and owner of a thriving nutrition coaching business. I've been helping my clients with weight loss & meal planning for years, and have seen all the challenges that people face when it comes to understanding what and how much to eat. I have found solutions to managing weight for the busy professionals, students, stressed out stay-at-home moms and people who are novice cooks ...I've helped almost all walks of life, and I've got you covered! 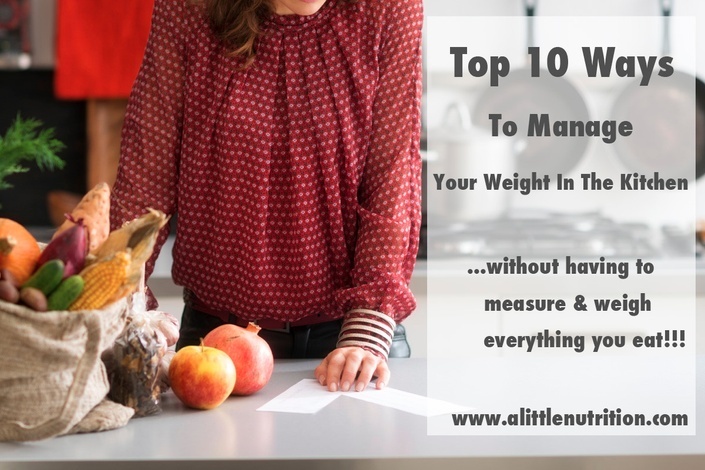 Top 10 Ways To Manage Your Weight In The Kitchen ...without measuring and weighing everything you eat!